A new year is a great time set new goals, build on previous finished and unfinished goals, and develop good habits for personal growth, personal enrichment, positive personal well being. Most experienced journal writers know that the power of journal writing lies in writing and reflection. First off, writing things down —be it in a journal, a planner, or worksheet —is a form of commitment. It’s an action that goes beyond passive thoughts and wishful thinking. I don’t see writing as a magical force that automatically leads to achieving one’s goals, but I do see writing as a way of making sense of our life, and figuring out how we can overcome obstacles and connect with our subconscious thoughts. I don’t achieve all my goals as planned, and my bucket list still only has about five or six items scratched off, but the act of getting things done guides by my writing. NaJoWriMo, for instance, started as written goal in my journal. Writing my first book was helped along by keeping a journal throughout the entire process. It was the writing that always brought me back to the project after being away from it for a while. Through your writing, your subconscious is letting you know what you want. Writing speaks to us, gives us clues, sometimes in a roundabout ways. Use your writing to interpret the symbols. Too often some people think that simply making a list of goals is enough. We’ve often been told to make a plan for how we will achieve our goals. Developing a plan is definitely important, but writing about goals on a regular basis helps us dig deeper into ourselves and discover the why, how, and when of what we’re striving to achieve. In the process of writing it down, of visualizing, there is a constant surrender, a constant working on the issues to keep you from your fulfillment. It is not only about writing things down. There is a parallel course, there is work that has to be done [emphasis added]. You see, journal writing can bring us back to what is most important, especially if we write honestly and on a regular basis. Journal writing can help us with achieving our goals, improve our studies, our personal relationships, and address habits we’re trying to change or develop, but the writing is most useful when we’re in the act of doing, of getting things done. It may take a lot longer to achieve our goals than we planned, and sometimes we don’t achieve what we set out to do. But in the process we do get things done, and we even accomplish unexpected achievements. 1. Select your method of journal writing: pen and notebook, online journaling, or digital journaling using a computer or mobile application. 2. You can certainly complete the NaJoWriMo any way you like, but you might want to take a one of three journal writing challenges for the month. 3. If possible, set aside a schedule time to write in your journal, such as in the morning before going to work or school, or before going to bed. If you schedule the time, you’re more likely to get the writing done. 4. If you’re Twitter user, use the hashtag, #amjournalwriting to share about your daily journal writing. You can search that tag or bookmark this page to see tweets using the tag. Using this hashtag will help spread the word about how useful journal writing can be for various purposes. NaJoWriMo is set up for you to start on the day you choose, though the official months are January, April, July, and October. The theme for the January NaJoWriMo is Personal Growth and Achieving Goals. You can subscribe to receive prompts for this theme by heading over to the NaJoWriMo Courses page. Signing up for NaJoWriMo, January 2019. Taking the 31-Day journal writing challenge. It’s important that you use NaJoWriMo for your particular needs so that you can get the most out of your journal writing. As 2018 comes to a close, now might be a good time to do some journal reflection on the past year. Did you write goals for 2018? If so, review them and see what progress you made. On the scale of 1-10 what would you rate 2018 in terms of your personal achievement and well being. 10 being very positive. Make a list of experiences you most value or are most grateful for in 2018. Make a list of what you gained and what you lost in 2018. What changes, both big and small, happened for you in 2018? What was most unexpected in your life in 2018? What got left undone in 2018 that you still want to accomplish. One of the benefits of a year-end reflection is figuring out what you want to achieve in the new year and what you should probably let go of. Also, I encourage you not be to hard on yourself. Too often we don’t acknowledge many of the external factors that get in the way of what we’re trying to achieve, and we end up blaming ourselves for what didn’t accomplishment. Resist doing that. There’s always next month, next year, two or three years from now. We always have time for what is most important in your life. Just used a few NaJoWriMo writing prompts to do some reflective writing about 2018. I hope you’re looking forward to NaJoWriMo as much as I am. Please feel free to share how you use your journal for reaching your goals. I as usual, I welcome your feedback on NaJoWriMo and how it can be improved. Whichever approach you choose to participate in NaJoWriMo, be sure to subscribe for updates from this site. 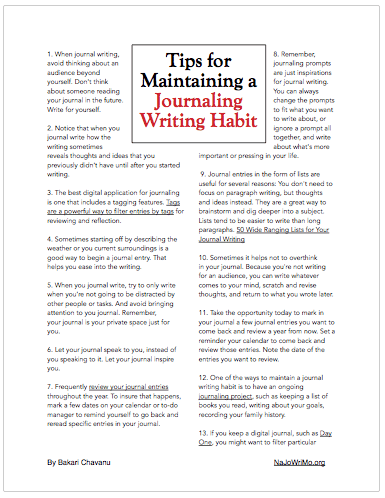 The subscription is free, and you will receive tips, reminders, and suggested resources for getting the most out of journal writing. Hi Mariner, I’m not sure what you’re revering to. Are talking about the challenge of daily journal writing? I really needed to do some journaling for time management. I am so looking forward to your tips and helps for the making my future much brighter and happier.